I'm not a city-person. I wouldn't really say I'm a country-person, either, but I would much prefer taking a vacation in the woods rather than in, say, New York. In the Star Wars universe, if you were force-sensitive and you wanted to go all Bear Grylls and just go live in the woods, you'd be a Seeker. 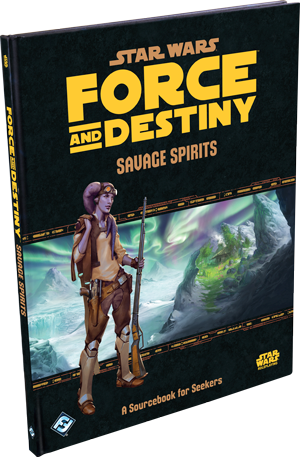 It's that character type that's focused on in Savage Spirits, a new sourcebook for the Star Wars RPG from Fantasy Flight Games. In the book, Seekers get a new Specialization, Background material, Moralities, and Signature Abilities. For anyone and everyone, it's like an L.L. Bean catalog for all the new gear you can potentially buy for your next extended-stay camping trip in the wilds of some remote planet. And to make sure that stay isn't as simple as heading to your local Hilton, there's rules for the GM to incorporate rules for wilderness settings and survival. Bugs. You'll probably have to eat bugs. Hopefully you don't mind eating bugs. Expect to see the book on store shelves sometime in the 2nd quarter of this year.